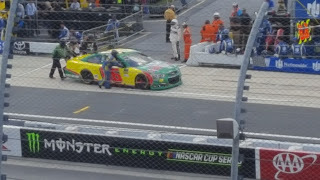 Timmy Hill picked up the 5th last-place finish of his Monster Energy NASCAR Cup Series career in Sunday’s Apache Warrior 400 by Lucas Oil at the Dover International Speedway when his #66 U.S. Chrome / O.C.R. Gaz Bar Chevrolet fell out with electrical issues after 39 of 400 laps. The finish, which came in Hill’s 62nd series start, was his first since November 15, 2015, when his #62 Prairie Auto Credit Chevrolet finished under power, 92 laps down, in the Quicken Loans Race For Heroes 500 at the Jeff Gordon Raceway (aka Phoenix International Raceway, soon to be ISM Raceway). After making just one Cup start for Premium Motorsports in last fall’s Dover race (finishing 34th), Hill returned to the venue early this summer in a new ride for an old team. Since 2015, Hill had been driving for Motorsports Business Management (MBM), a small two-car XFINITY Series team founded by Derek White and now owned by Carl Long. 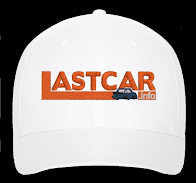 His best finishes with MBM came just this year, when he finished 17th at both Talladega and the July race at Daytona. While running the first one-third of the 2017 Cup season for Rick Ware Racing, the team which gave him his Cup debut five years ago, Hill also helped Carl Long and the MBM team in preparing a new Cup Series car. 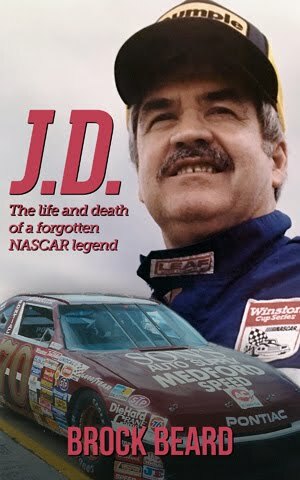 The #66 Chevrolet would be decaled to resemble the #46 Romeo Guest Construction Dodge that was handed NASCAR’s heaviest penalty over an engine infraction in 2009, ultimately closing Carl Long’s former team. Long drove the green-and-gold car first, making his return with a 31st-place run at Kansas. 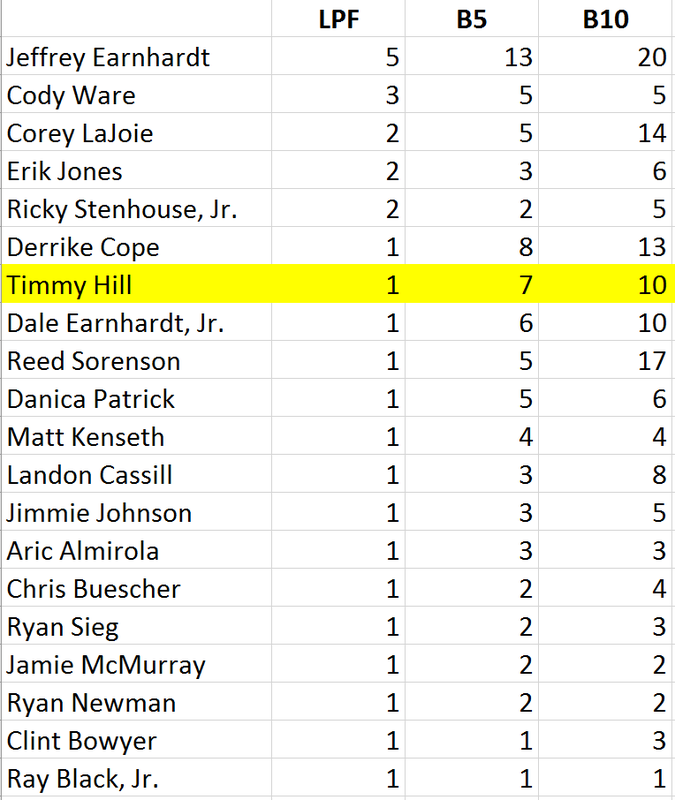 Hill has driven the car in each start since, including at Darlington, where he relieved Long midway through the Bojangles’ Southern 500. Hill’s best run came at Indianapolis in July, where he dodged all the late-race wrecks for a career-best 14th. 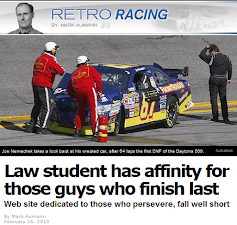 Through it all, MBM’s #66 had never finished last, nor even failed to finish. 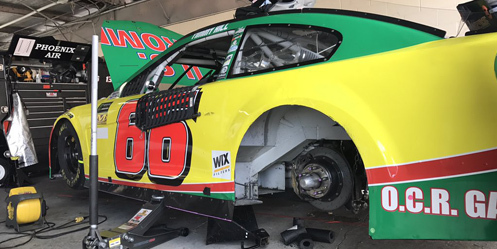 Hill and MBM’s #66 arrived last week in Dover, where Hill finished 28th in his first Cup start for the team this past June, as one of 40 drivers. The race was also to see the debut of Derrike Cope’s StarCom Racing, which along with MBM were the only new Cup teams to join the circuit since SpeedWeeks, but StarCom withdrew on Tuesday. Hill’s Dover car carried sponsorship on the hood from U.S. Chrome, who backed Hill during his brief rookie campaign for Go FAS Racing in 2013, Hill ranked 37th in the opening practice, his best of five laps ranking him ahead of fellow Open drivers Reed Sorenson and B.J. McLeod. He secured 35th on the grid in qualifying with a lap of 151.835mph. Another five laps in Saturday’s first practice left him 39th of 40 ahead of McLeod, then sat out Happy Hour. In between, Hill ran 33rd in the XFINITY race in MBM’s #13 TLC Resorts Chevrolet, a car which he has “start-and-parked” for most of his schedule as part of the team’s expansion into full-race Cup efforts. Starting last on Sunday was Matt DiBenedetto in Go FAS Racing’s #32 Keen Parts Ford. DiBenedetto was driving the same Bobby Allison 1988 throwback scheme from last month’s race at Darlington, though with a few small changes: the white stripe along the front bumper was removed, as was Allison’s signature from each door, and the Keen Parts logo on the hood was slightly smaller. The car also struggled on track, losing fuel pressure during their one qualifying lap, which ultimately led to their being the only car without a timed lap. 39th-place starter Reed Sorenson had a similar issue with the fuel pump, the car shutting down so early on his timed lap that the circuit took more than three full minutes, averaging just 18.775mph. Despite these issues, only B.J. McLeod in Rick Ware’s #51 Donnie Neunberger Foundation Chevrolet was sent to the back prior to the start for unapproved adjustments. Coming to the green, Hill joined McLeod in the final row. While Hill managed to move past a handful of cars, McLeod lost ground to the pack. In so doing, McLeod joined Ray Black, Jr. and Cody Ware as the third-straight Rick Ware Racing driver to trail the first lap of a Cup Series race. By Lap 9, McLeod was 17.573 seconds behind the leader, almost a full second behind the new 39th-place driver Jeffrey Earnhardt in the #33 Hulu Chevrolet. 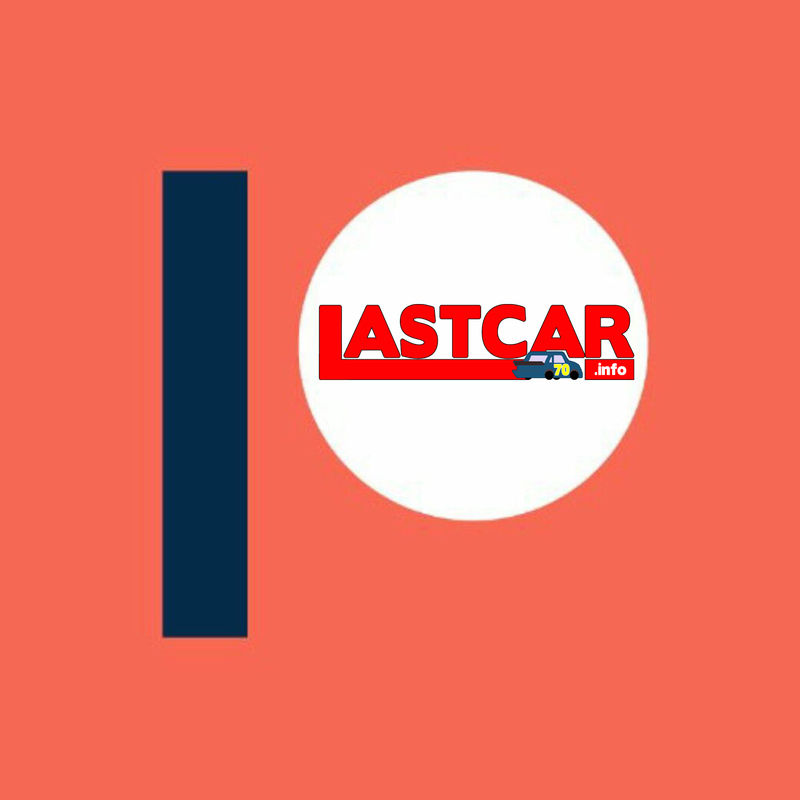 On the 15th circuit, McLeod’s car was the first to lose a lap. An unscheduled stop around Lap 29 cost McLeod two more, and he slowed on the backstretch for another stop on Lap 31, dropping him five behind. 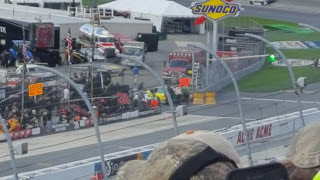 Around Lap 40, as McLeod returned to competition, Timmy Hill came to pit road, reporting that the car was cutting off. The crew pushed the #66 to the garage area, where they discovered that the alternator wasn’t charging the batteries, ultimately draining two of them. On Lap 124, long after the #66 had taken last from McLeod, Hill tweeted that the crew was still hard at work trying to diagnose the problem. When Reed Sorenson’s engine let go on Lap 167, dropping him to 39th by Lap 208, the window for MBM to gain spots was closing fast. If the team didn’t come back out by Lap 277, the car wouldn’t be able to pass Sorenson even if they ran the rest of the race. By all accounts, the team didn’t wait that long. 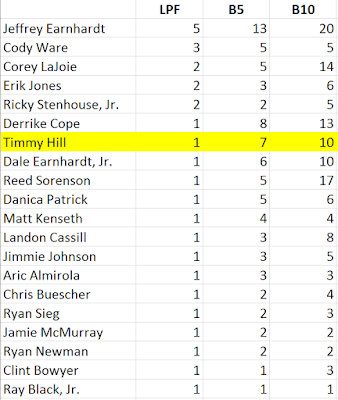 On Lap 254, NBC’s leaderboard indicated both Hill and Sorenson were out of the race. 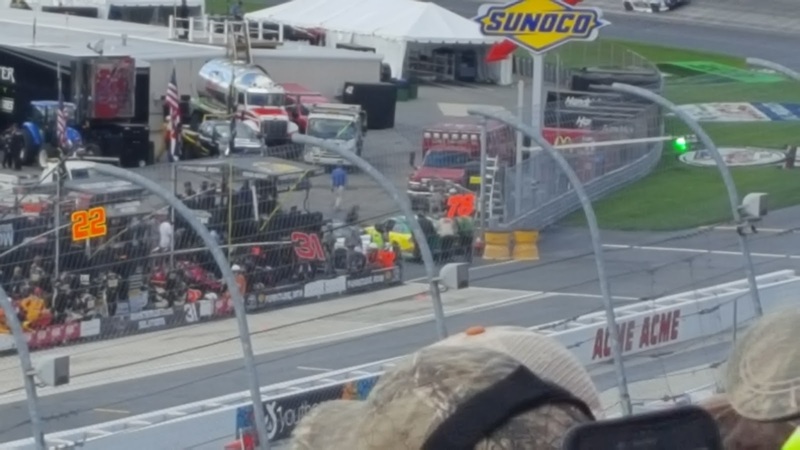 38th went to Sorenson’s teammate Ross Chastain, who was unable to follow-up his strong 20th-place run in his series debut at Dover in June due to a series of mechanical issues. After at least one trip to the garage area, Chastain finished under power, but 52 circuits behind. 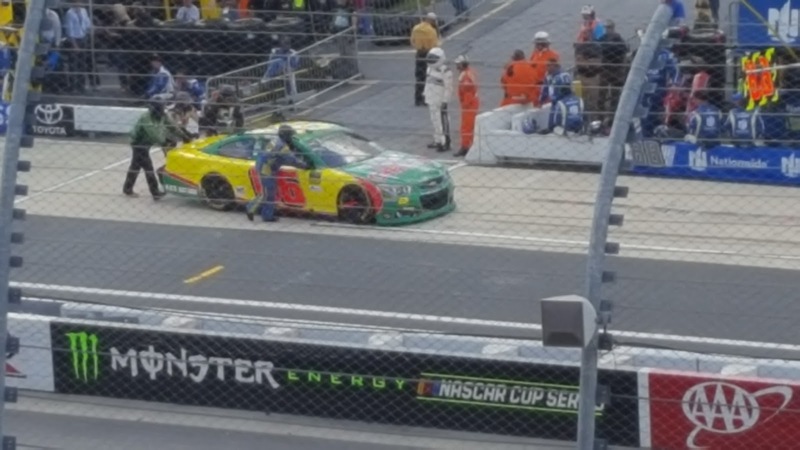 Twenty laps in front of him came 37th-place Jeffrey Earnhardt, whose backward slide into the sand barrels at the end of pit road during green-flag stops on Lap 87 proved critical to several Playoff contenders, including “bubble” drivers Ricky Stenhouse, Jr. and Ryan Newman. McLeod rounded out the group, four laps ahead of Earnhardt. *This marked the first last-place finish for car #66 in a Cup Series race at Dover since May 15, 2011, when Michael McDowell’s HP Racing Toyota also fell out with electrical problems after 45 laps of the FedEx 400 Benefiting Autism Speaks.